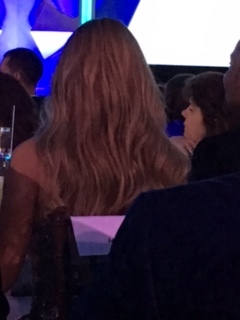 I was comforted by the fact that I wasn’t the only clergyperson goggling at celebrities, but I’ll let my clergy colleague—who asked me to take more than one photo of her with a celebrity at the gala—remain unidentified. and a view of Robert De Niro (unfortunately, he was a little too far away for a good photo). It wasn’t hard to get a little star struck at the event, but now that the show is over and I’m heading back to my country bumpkin life, I’ve been reflecting a bit on the spectacle and realizing that the real stars of the evening were not the celebrities whose names everyone knew and who barely got a moment of peace between people approaching to speak to them and to take photos. The real stars of the evening were the Maines family, who were introduced at the gala by Tamron Hall. The father of the family, Wayne, spoke lovingly and thoughtfully about being the father of a transgender child (now a young adult). He spoke of his journey, and of the transition that he had to make, letting go of certain hopes and dreams for his identical twin boys, facing his fears and opening his heart to a new set of hopes and dreams, involving identical twins who are actually a boy and a girl. It was clear that, while he is in a good place now, he’s been on a painful and often difficult journey which has involved loving, supporting and encouraging both children in ways that he had never anticipated. I can’t say that I have much in common with Mr. Maines, except that I’m a parent myself. Perhaps that’s why I was so drawn to his remarks. But, I am not the parent of a transgender child and there are no—identified—transgender people in my family. I have some relationship, though, with the transgender world, as the friend of a transgender person and her family. I’ve been thinking about that journey as well. 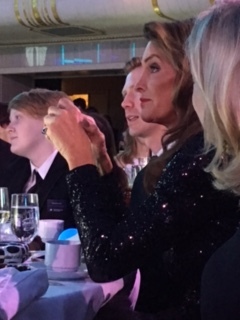 At Saturday’s GLAAD gala, there was a lot of talk about allies and friends, as that was highlighted in the awards given to Mariah Carey and Robert De Niro. But, it seems clear to me that there are other truly significant allies and friends, and family, and those are the people who, in the course of their very ordinary lives, live out the notion that we should strive for acceptance and good relationship, that we should love others as we want to be loved ourselves. We should be more willing to recognize and face our own fears when we don’t understand, seeking knowledge before judgment. While celebrities might be able to point the way, the work is done in a lot of smaller, seemingly inconsequential, moments. Each of us has the ability to light that path, showing kindness, loving and respecting people for who they are—in the ordinary corners, families and communities in which we live. It’s not very glamorous, but it’s what truly counts. 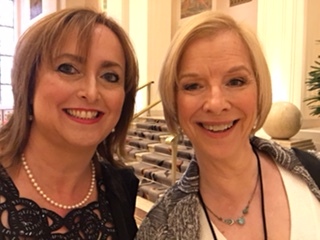 This entry was posted in LBGTQ and tagged Caitlyn Jenner, GLAAD Media Awards, Jennifer Finney Boylan, Jonas Maines, Nicole Maines, Wayne Maines. Bookmark the permalink.